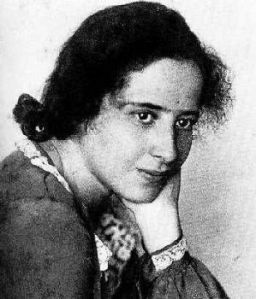 Hannah Arendt was an influential German Jewish political theorist. She has often been described as a philosopher, although she refused that label on the grounds that philosophy is concerned with "man in the singular." She described herself instead as a political theorist because her work centers on the fact that "men, not Man, live on the earth and inhabit the world." Arendt's work deals with the nature of power, and the subjects of politics, authority, and totalitarianism. Much of her work focuses on affirming a conception of freedom which is synonymous with collective political action among equals. As witnesses not of our intentions but of our conduct, we can be true or false, and the hypocrite's crime is that he bears false witness against himself. What makes it so plausible to assume that hypocrisy is the vice of vices is that integrity can indeed exist under the cover of all other vices except this one. Only crime and the criminal, it is true, confront us with the perplexity of radical evil; but only the hypocrite is really rotten to the core. It is well known that the most radical revolutionary will become a conservative on the day after the revolution.